The morning before we left DC, I made reservations for brunch at this quaint little restaurant called Firefly, as it was super close to where we were staying in Dupont Circle. 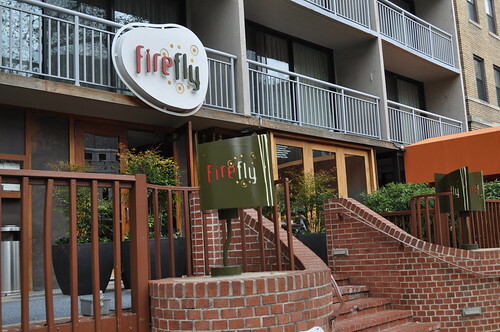 Inside Firefly, an urban neighborhood restaurant run by Executive Chef Daniel Bortnick. The menu is focused on "American comfort food reborn as contemporary takes on classics," while the restaurant is committed to supporting local purveyors and farmers and using seasonal ingredients to drive "ever-evolving seasonal menus." The interior and design of the restaurant also embraces this commitment to sustaintability, especially with regards to the environment. The tables are made from salvaged barnwood and the wine bottles are made from recycled glassware. 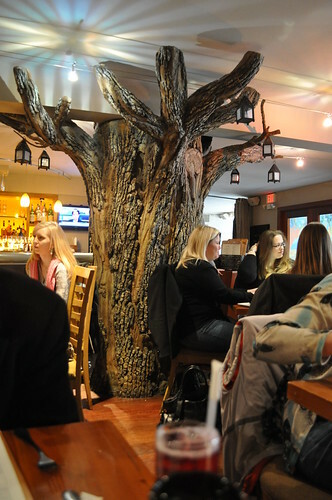 Here is the floor-to-ceiling "firefly tree," hung with lanterns and lit by candles right in the center of the dining area. The menu at Firefly. I love the copper-colored salt and pepper shakers. 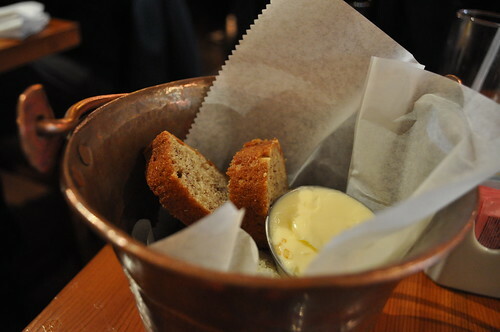 Bread basket was also made with similar copper and filled with banana bread and butter! I ordered Pop Pop's french toast, which was orange and vanilla dipped challah bread with apple-raisin compote and maple syrup. 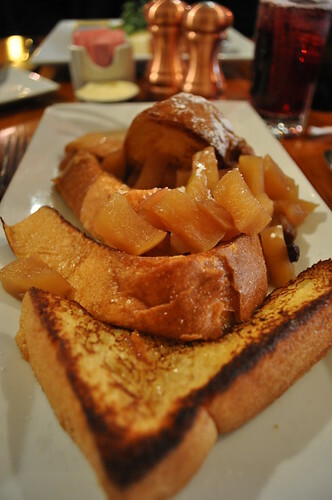 If there's ever french toast on a menu that is made using challah bread, you have my brunch order right there, as I could never turn down challah french toast! The challah bread nicely absorbed the orange-vanilla flavors and were cooked very evenly. The warm french toast with the apple-raisin compote was a great combination, and I liked that french toast wasn't drenched in maple syrup. The plate was nicely glazed with a few dollops of syrup. 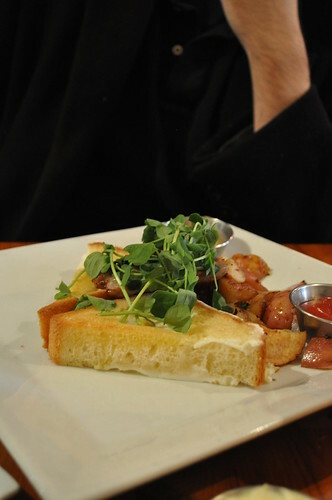 Some winning french toast at Firefly, that's for sure! Marcus had a dish called snake eyes, which had two soft-cooked eggs in a bread basket, country sausage, red eye gravy, and potatoes. It was exactly like the "egg-in-the-whole" menu items I've had at other establishments for brunch. Marcus requested for the gravy on the side to avoid any drowning of the food items. The bread was really soft, and he liked how the bread went well with the eggs, the country sausage, and gravy. Besides, what better way to eat a runny egg than with nice piece of toast! 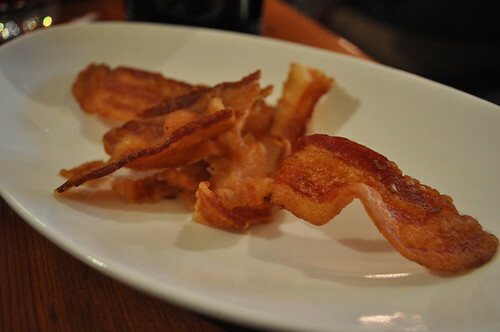 Marcus and I shared a side of applewood bacon. It was cooked until it was super crispy--not oily one bit, which totally won us over. 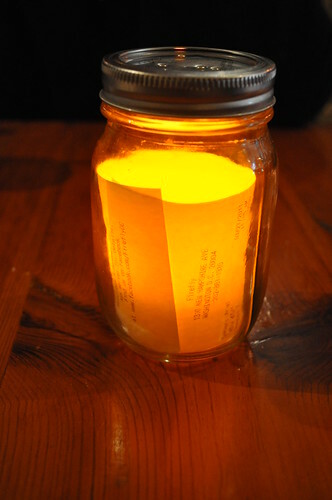 At the end of the meal, our server gave us our check in mason jar with an electronically lit tealight to emulate those jars we used to have during our childhood where we stored the fireflies we would catch so we can see them light up. It was quite authentic, I would have to say, mainly because they had randomly punctured holes on the jar's lid, so the fireflies could breathe! 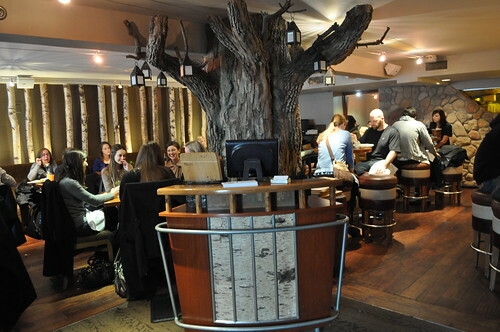 Findings: If you're looking for a great brunch spot in DC, Firefly is definitely a safe bet! It wasn't very difficult getting a reservation here a week or so before the actual date via OpenTable, so last minute planning is flexible here. It is quite popular, so I would make reservations as soon as possible. All of the menu offerings seemed great brunch dishes, so you really can't go wrong with anything. Our server was very friendly and welcoming, and there's a lovely neighborhood feel to the restaurant as well, which makes it different from any tourist trap you may fall into! Price point: $12-14 for each brunch dish, $4 for the side. 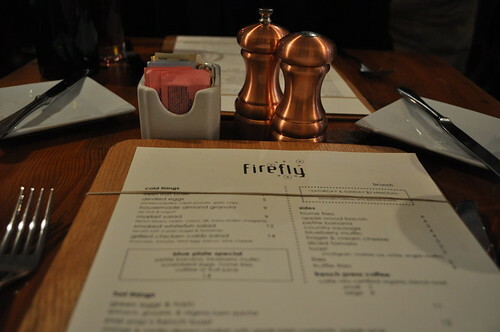 Tags: 2011, American Traditional, brunch, dining reviews, Firefly, first visit, restaurants, Washington D.C.